نظم قانون المحكمة الدستورية العليا الفلسطيني الأحكام المتعلقة بإجراءات مساءلة قضاة المحكمة الدستورية تأديبياً في حال ارتكاب أي منهم لأي أمر من شأنه المساس بالثقة أو الاعتبار أو الإخلال المتعمد أو الجسيم بواجبات أو مقتضيات وظيفته، وبين العقوبات التأديبية التي يمكن توقيعها على القاضي المخالف، وقد تناولنا هذه الأحكام بالدراسة والتحليل لبيان طبيعة النظام التأديبي الذي أخذ به المشرع الفلسطيني في تأديب قضاة المحكمة الدستورية، والإجراءات والضمانات التي قررها المشرع أثناء مساءلتهم تأديبياً، وخلصنا إلى وجوب الأخذ بالنظام القضائي في تأديب أعضاء المحكمة الدستورية، وتضمين القانون كافة الضمانات التي تحقق سلامة معايير العدالة التأديبية، والمتمثلة في حق اطلاع القاضي المحال للتأديب على الأوراق والمحاضر الخاصة بالتحقيق، ووجوب مواجهته بالمخالفة المنسوبة إليه، والأدلة والبينات التي تؤكد صحة ارتكابها، وحق الاعتراض على أعضاء اللجنة الوقتية أو لجنة التحقيق، أو أي من أعضاء الجمعية العامة، وطلب رد أيٍ منهم إذا ما توافرت أسباب جدية يخشى معها عدم نزاهة التحقيقات وإجراءات المحاكمة التأديبية، وتسبيب القرارات التأديبية، وحق التظلم منها، والطعن فيها أمام المحكمة المختصة. The law of the Palestinian High Constitutional Court arranges the provisions relating to the procedures of the judicial accountability of the judges of the Constitutional Court in the event that any of them is committed to any matter that would prejudice the trust, or consideration or intentional or gross violation of the duties or requirements of his job, and illustrated the disciplinary sanctions that may be imposed on the offending judge. 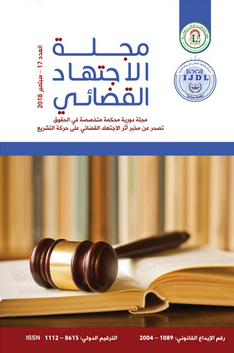 We also showed these provisions with the study and analysis to explain the nature of the disciplinary system which adopted by the Palestinian legislator in the discipline the judges of the Constitutional Court, and the Procedures and the guarantees that is determined by the legislator during their disciplinary proceedings. We concluded that the judicial system must be disciplined by the members of the Constitutional Court, and getting the law include all guarantees that ensure the integrity of the standards of disciplinary justice, which that the right of assigned judge to the disciplinary to inform papers and records of the investigation, and the necessity of confront him with the offense attributed to him, and evidence and data that confirm the validity of the commission, and that right to object to the members of the temporary committee or the inquiry commission, or any of the members of the General Assembly, and to request the response of any of them if there are serious reasons for which the impartiality of the investigations and the disciplinary proceedings, and causing the disciplinary decisions, in addition to the right to complain and appeal it in the competent court. Keywords: (disciplinary system, constitutional court, disciplinary offense, disciplinary accountability, disciplinary punishment).